For decades the Magistrate has been a loyal servant of the Empire, running the affairs of a tiny frontier settlement and ignoring the impending war with the barbarians. When interrogation experts arrive, however, he witnesses the Empire's cruel and unjust treatment of prisoners of war. Jolted into sympathy for their victims, he commits a quixotic act of rebellion that brands him an enemy of the state. 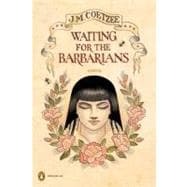 A modern classic, this early novel by Nobel Laureate J. M. Coetzee centers on the crisis of conscience and morality of the Magistrate-a loyal servant of the Empire working in a tiny frontier town, doing his best to ignore an inevitable war with the "barbarians." Chris Conn was born in Hollywood, California in 1970 and was a celebrated tattoo artist for sixteen years. He is now a successful illustrator and painter based out of San Francisco. This is an enjoyable and very short textbook. It is true literature, so not a very light reading if you are looking for a pastime. This is a modern classic, an early novel by Nobel Laureate J. M. Coetzee centers on the crisis of conscience and morality of the Magistrate-a loyal servant of the Empire working in a tiny frontier town, doing his best to ignore an inevitable war with the "barbarians." I would highly recommend it be part of your must-read repertoire if it is not already. Waiting for the Barbarians: 5 out of 5 stars based on 1 user reviews.